AMMONNEWS - The Jordanian daily newspaper Al Arab Al Yawm will be temporarily suspended starting on Thursday amid financial problems facing the newspaper administration, who has not paid salaries to its employees in over two months. Al Arab Al Yawm owner Elyas Jreisat announced on Tuesday night that the newspaper will not be printed as of Thursday, as it printed its last issue before the temporary suspension on Wednesday. The suspension came after the Addustour daily announced halting the printing of its colleague newspaper Al Arab Al Yawm at its printing press, issuing a warning to the latter for failure to pay financial debts to the printers. Meanwhile, the government expressed regret at the decision to halt the issuance of the daily newspaper. "What is happening at Al Arab Al Yawm saddens us," Jordan's government spokesperson Mohammad Momani said during a meeting with the Jordan Press Association Tuesday night. 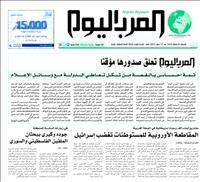 Al Arab Al Yawm had been published daily in Jordan for the past 17 years. The newspaper announced that it will reimburse its subscribers for the duration of the suspension period.